Are 'Telomeres' the key to unlocking eternal youth? they replicate but they also regenerate our bodies. practice associated with longer telomeres. and shorter telomeres have been linked to chronic stress. might be associated with longer telomere lengths. such as volunteering and caregiving, and overall health and longevity. and control participants who had done no meditation." Contents lists available at SciVerse Science Direct Brain, Behavior, and Immunity journal. Telomeres are nucleoprotein structures located at the ends of chromosomes which shorten with repetitive cell division and rep- lication. Generally, telomeres shorten with age, and this shortening may be accelerated in the presence of cellular oxidative damage or chronic psychological stress (Damjanovic et al., 2007; Epel et al., 2004; Kotrschal et al., 2007). For example, caretakers of family members with Alzheimer’s dementia had shorter telomeres than age and gender matched controls, and patients with chronic mood disorders had shorter telomeres than age and gender matched controls (Damjanovic et al., 2007; Simon et al., 2006). ⇑ Corresponding author. Address: Center for Anxiety and Traumatic Stress Disorders, Massachusetts General Hospital, One Bowdoin Square, 6th Flr., Boston, MA 02114, USA. Tel. : +1 617 724 0859; fax: +1 617 643 0730. E-mail address: ehoge@partners.org (E.A. Hoge). 0889-1591/$ - see front matter Ó 2013 Elsevier Inc. All rights reserved. 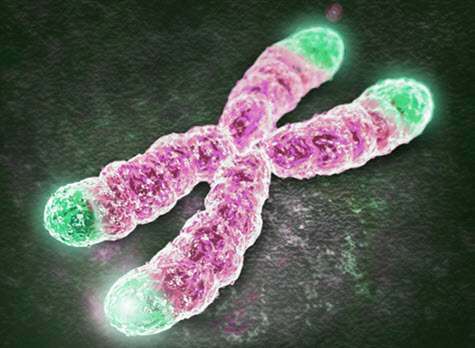 Relatively short telomere length may serve as a marker of accelerated aging, and shorter telomeres have been linked to chronic stress. Specific lifestyle behaviors that can mitigate the effects of stress might be associated with longer telomere lengths. Previous research suggests a link between behaviors that focus on the well-being of others, such as volunteering and caregiving, and overall health and longevity. We examined relative telomere length in a group of individuals experienced in Loving-Kindness Meditation (LKM), a practice derived from the Buddhist tradition which utilizes a focus on unselfish kindness and warmth towards all people, and control participants who had done no meditation. Blood was collected by venipuncture, and Genomic DNA was extracted from peripheral blood leukocytes. Quantitative real time PCR was used to measure relative telomere length (RTL) (Cawthon, 2002) in fifteen LKM practitio- ners and 22 control participants. There were no significant differences in age, gender, race, education, or exposure to trauma, but the control group had a higher mean body mass index (BMI) and lower rates of past depression. The LKM practitioners had longer RTL than controls at the trend level (p = .083); among women, the LKM practitioners had significantly longer RTL than controls, (p = .007), which remained sig- nificant even after controlling for BMI and past depression. Although limited by small sample size, these results offer the intriguing possibility that LKM practice, especially in women, might alter RTL, a bio- marker associated with longevity. (although not always (Glass et al., 2010)), high phobic anxiety (Okereke et al., 2012), severe job stress (Ahola et al., 2012), concur- rent stress and chronic pain (Sibille et al., 2012), and poor sleep (Prather et al., 2011). Notably, shorter telomeres have been associated with earlier mortality (Cawthon et al., 2003). Therefore, telomere length may reflect the association of psychological well-being on health and longevity. It is not clear whether lifestyle factors can increase telomere length or slow the shortening of telomeres, but there are studies that show associations between health behaviors or lifestyle choices and telomere length or telomerase, the enzyme that helps repair telomeres by adding DNA hexameric repeats to restore telo- mere length. For example, physical exercise has been shown to be associated with longer telomeres and higher telomerase activity, and was found to moderate the effect of stress on telomere length (Ludlow et al., 2008; Puterman et al., 2010; Werner et al., 2009). A wide variety of healthy behaviors and health related factors have been associated with longer telomeres (body mass index below 25 kg/m2, non-smoking, healthy diet, and moderate to vigorous exercise) (Sun et al., 2012). Lastly, being married has been associ- ated with longer telomere length at trend-level significance (p = 0.067, (Yen and Lung, 2012)). There is evidence that meditation training could also affect tel- omerase. In a longitudinal study of overweight or obese women, mindfulness meditation was associated with a 39% increase in tel- omerase activity over 4 months, which was a 18% greater increase in telomerase activity compared to a control group, although this difference did not reach significance (Daubenmier et al., 2012). In another longitudinal study, older adults who took care of persons with dementia were taught a type of yogic meditation (Kirtan Kriya) or given music to listen to. The yogic meditation group had a greater rise in telomerase activity compared to the group who listened to music (Lavretsky et al., 2013). A study of intensive daily meditation practice showed higher cross-sectional telome- rase activity in a group of individuals at the end of an intensive three-month full-time mediation retreat, compared to a waitlist control group (Jacobs et al., 2011). Concurrent psychometric measures were associated with greater telomerase activity: increases in Perceived Control, decreased Neuroticism, and increased Purpose in Life. The above findings suggest that meditation training could potentially have a protective effect on telomeres. A strong theoret- ical basis has been forwarded that suggests that mindfulness med- itation training could have beneficial effects on telomeres by reducing cognitive stress and increasing positive states of mind (Epel et al., 2009). ​This hypothesis is supported by data from multi- ple trials that suggest that meditation practice reduces psycholog- ical stress (Kvillemo and Branstrom, 2011; Manocha et al., 2011; Smith et al., 2008). If meditation practice protects telomeres against accelerated aging due to stress, we would expect to see longer telomeres in long-term experienced meditators. Data from other methodologies suggest that meditation could have a protective effect against aging, including a study showing a lack of agerelated atrophy of brain grey matter (Lazar et al., 2005). (metta from the Pali lan- guage of the Buddhist scripture), is a type of meditation practice that focuses on developing a positive intention, unselfish kindness and warmth towards all people (Salzberg, 1995). Preliminary work on Loving-Kindness Meditation (LKM) has demonstrated positive effects of this practice. For example, employees who signed up for a workplace wellness program were randomized to learn LKM or were placed on a waitlist. After 7 weeks, individuals in the LKM program had more positive emotions, a sense of purpose in life, social support, and decreased illness symptoms such as head- aches, congestion or weakness (Fredrickson et al., 2008). In a pilot study of patients with chronic low back pain randomized to LKM or standard care, LKM was associated with greater decreases in pain, anger, and psychological distress than the control group (Carson et al., 2005). The above data taken together suggest that LKM, a practice that promotes positive feelings towards others, can im- proves overall health. Because shorter telomeres are associated with chronic psychological stress, and LKM appears to decrease stress, we examined telomere length in a population of experi- enced LKM meditators, and hypothesized that they would have longer telomeres than age, gender, and education-matched con- trols. In addition, since evidence from the literature suggests that telomere length is longer in women (Bekaert et al., 2007; Nawrot et al., 2004), we decided to also analyze genders separately. meditation communities and retreat centers in New England. To participate, individuals had to have 4 years or more of regular, nearly daily LKM practice, and must have attended at least one overnight meditation retreat (not necessarily LKM) of 3 days or more duration. Control participants were also age 18 or above, but were required not to have experience with any meditation or yoga practices (no more than 4 classes over the lifetime). Exclusion criteria included the current diagnosis of any of the following mental disorders as defined by the DSM-IV and assessed by the Mini-International Neuropsychiatric Interview (Sheehan et al., 1998): schizophrenia or other psychosis, mental retardation, post-traumatic stress disorder, alcohol or substance abuse or dependence, major depression, panic disorder, or generalized anx- iety disorder. Participants were also excluded if they had a serious current medical illness, if they took hormonal medication such as oral contraceptives or hormone replacement therapy, had endo- crine diseases such as Addison’s or Cushing’s disease, had an acute inflammatory disease, had a diagnosis of cancer in the last 5 years, or were pregnant or lactating. We recruited 75% of the LKM group first, and then recruited controls that resembled the LKM group, targeting the mean age (±5years), gender proportions, education level, and levels of depression history that was observed in the LKM group. Several individuals in the LKM group had a history of past major depres- sive episodes, and experienced meditators were also found to be highly educated; many had a graduate degree. Therefore, in order to prevent confounding, we over-enrolled control participants that had a past history of depression and a graduate level of education. Subjects arrived at the laboratory between 1 pm and 3 pm. Blood was obtained by venipuncture from an anticubital vein and collected into tubes containing Ficoll gel for separation of leukocytes by centrifugation. Leukocytes were rinsed in phosphate buf- fer solution and the remaining cell pellet stored at -80 degrees Celsius. Genomic DNA was extracted from peripheral blood leukocytes using the QIAamp 96-spin DNA blood protocol (QIAGEN, Valencia, CA). Quantitation of genomic DNA with PicoGreen was performed using a Molecular Devices 96-well spectrophotometer. To assess relative leukocyte telomere length, quantitative real-time poly- merase chain reaction (McGrath et al., 2007) was performed on the 7900 HT Sequence Detection System (Applied Biosystems, Fos- ter City, CA). Drying down 5 ng of the genomic DNA and resus- pending it in 10 lL of either telomere or single-gene (36B4) PCR reaction mix standardized the samples. The telomere PCR reaction mix consists of 1ﰀ QuantiTect SYBR Green PCR Master Mix, 2.5 mM of DTT, 270 nM Tel-1b primer, and 900 nM of Tel-2b primer. Assays proceeded for 1 cycle at 95 °C for 10 min, followed by 30 cycles at 95 °C for 15 s and 54 °C for 2 min. The 36B4 PCR reaction mix con- sists of 1ﰀ QuantiTect SYBR Green PCR Master Mix, 300 nM 36B4u primer and 500 nM 36B4d primer. The 36B4 thermal cycling pro- ceeded with 1 cycle at 95 °C for 10 min, followed by 30 cycles at 95 °C for 15 s and 58 °C for 1 min 10 s.
ratio were less than 12%. Although this assay provides a relative measurement of telomere length, T/S ratios correlate well with absolute telomere lengths determined by Southern blot (r = 0.82, p < 0.0001) (Cawthon, 2002). A Shapiro–Wilk test showed that our RTL data were not nor- mally distributed (W = 0.88, V = 4.38, z = 3.1, p = 0.00096). A log transformation further failed to produce a normal distribution (W = 0.91, V = 3.3, z = 2.5, p = 0.0058). Therefore, we felt that the most conservative approach was to use non-parametric tests; we thus compared RTL between the two groups with a two-sample Wilcoxon rank-sum (Mann–Whitney) test. Demographic variables were compared using independent samples t-tests for continuous, and Fisher’s exact tests for dichotomous variables. Spearman’s par- tial rank order correlations were used to control for potential con- founders of the relationship between RTL and group. The telomere analysis sample included fifteen Loving-Kindness Meditation practitioners and 22 control participants. Fourteen of the participants were men, and 23 were women. The meditation practitioners typically practiced LKM as part of a larger set of Vip- assana meditation practices. The average number of lifetime hours of LKM was 512 h, with a range of 64–1825 h. Overall meditation practice lifetime hours was 4927, with a range of 432–20,695 h.
There were no significant differences in age, gender, race, edu- cation, or exposure to trauma (see Table 1). Even within females, there were no significant differences in age between meditators and controls (p = 0.23). The control group did have a higher Body Mass Index (BMI: see Table 1); however, in the overall sample, being overweight (BMIP25, n=16 vs. BMI<25, n=21) was not associated with RTL (z=ﰁ1.226, p=.22). In addition, the LKM group had a higher rate of past depression. Overall, median relative telomere length (RTL) was longer in meditation practitioners (0.39) compared to controls (0.27), which was significant at the trend level (rank sum z = ﰁ1.7, p = 0.083). Among women participants, telomere length was significantly longer in meditators (0.42) compared to controls (0.31), (z = ﰁ2.7, p = 0.007; please see (Fig. 1). There was no significant difference between groups among male participants. Since the RTL data was not normally distributed, we used par- tial Spearman rank correlations to examine the relationship be- tween meditation and RTL after controlling for BMI and depression. Even after controlling for potential confounding by these covariates, meditators had shorter telomeres compared to controls overall (r = 0.22, p = 0.21), with differences remaining sig- nificant within females only (r = 0.51, p = 0.018). We found longer relative telomere lengths in individuals with many years of experience in LKM, compared to age, gender, education, and trauma-matched individuals who did not meditate, at a trend level of significance. In our analysis stratified by gender, women meditators had significantly longer telomeres than gender matched controls. Previous reports suggest greater telomere attrition in males over time (Bekaert et al., 2007; Ren et al., 2009; Un- ryn et al., 2005), and it is possible that there might be an interaction with environmental factors such as the use of medita- tion practices or other lifestyle differences. The finding of longer telomeres in meditators is consistent with previous work that demonstrated an association between meditation and telomerase (Jacobs et al., 2011), and suggests the possibility that LKM could potentially have beneficial effects on telomere length, a marker of cellular aging linked to longevity. Meditation practice generally might have beneficial effects on health through its focus on non-judgment, acceptance, and Loving - Kindness. In particular, a meditation practice that is focused on the well-being of others would be hypothesized to have beneficial health effects: research in altruism, spousal caregiving, and volunteering supports the hypothesis that a focus on the well- being of others can improve one’s own health. Fig. 1. Relative Telomere Length in LKM Meditators and Controls. exercise, smoking, social support, age and gender (Oman et al., 1999). Forgiveness of others has also be associated with greater longevity in a longitudinal study of elderly (Toussaint et al., 2012). Although the mechanism is unclear, such effects may be in part a result of low levels of hostility towards others, which is related to medical morbidity and mortality (Smith et al., 2004). Preliminary research in compassion meditation practices, which similarly to LKM focuses on others, provides evidence for outward-focused meditation and health. Pace and colleagues have found relationships between compassion meditation based on the Tibetan lojong practice, and reduced markers of inflammation, chronic elevations of which are associated with poor health and in- creased mortality (Chrousos, 1998). In one study, the amount of time spent in meditation was correlated with the reduction of C- reactive protein over 6 weeks (Pace et al., 2013); in other work, individuals who performed more compassion meditation practice had lower interleukin-6 levels after a stress task which typically in- creases these levels, compared to the low-practice group (Pace et al., 2009). The association between LKM and RTL was stronger in women than men, but the reason for this is not clear. One potential con- tributor may be that the female experienced meditators spent more time practicing LKM (although not statistically significant: mean lifetime hours of LKM in women = 598 (SD: 577) versus 368 (SD: 298) mean lifetime hours in the men). We could also speculate that LKM practice leads to greater psychological, and therefore physiological, changes in women because they are able to utilize it better due to inherently greater empathic abilities or a greater focus on others; this potential difference in empathic capacity is supported by neuroimaging data showing stronger neural activation in women in emotion-related areas across several empathy tasks (emotion recognition, perspective taking and affec- tive responsiveness) (Derntl et al., 2010). The present study has several limitations. First, there were sig- nificantly higher rates of a history of depression in the meditation group; however, this would most likely to impact the telomere length in the opposite direction and decrease the significance of our finding, as depression has been reported to be associated with shorter telomeres in several studies (Hartmann et al., 2010; Simon et al., 2006; Wolkowitz et al., 2011). Secondly, the BMI of the control group was significantly higher, and obesity has been shown to be associated with shorter telomeres (Valdes et al., 2005); how- ever, after controlling for BMI, our finding in women was still significant. In addition, we cannot distinguish effects of LKM separately from participants Vipassana meditation practices gener- ally, since all meditators did both. To specifically test this question, one would need to compare three groups: Vipassana meditators who practiced very little LKM, meditators very experienced in LKM, and controls. Since we don’t have these three groups, we cannot rule out the possibility that the effects are due to meditation practice generally. In addition, we cannot rule out the effects of other health behaviors on RTL, that might have higher frequency in the meditation group such as vitamin use or exercise. Another limitation is that we did not have a measure of current perceived stress to test the relationship of RTL with stress. Lastly, the sample size is relatively small and data were non-normal, limiting the analyses to non-parametric testing. Nonetheless, the opportunity to examine the impact of lifestyle choices such as years of medita- tion training on telomere biology offers an intriguing line of future research. NS, MP, LF, CM). This work was also conducted with nursing support from Harvard Clinical and Translational Science Center (National Center for Research Resources and the National Center for Advanc- ing Translational Sciences, National Institutes of Health Award 8UL1TR000170-05 and financial contributions from Harvard University and its affiliated academic health care centers). The content is solely the responsibility of the authors and does not necessarily represent the official views of Harvard Catalyst, Harvard University and its affiliated academic health care centers, or the National Institutes of Health. Ahola, K., Sirén, I., Kivimäki, M., Ripatti, S., Aromaa, A., Lönnqvist, J., Hovatta, I., 2012. Work-related exhaustion and telomere length: a population-based study. PLoS ONE 7, e40186. Bekaert, S., Meyer, T.D., Rietzschel, E.R., Buyzere, M.L.D., Bacquer, D.D., Langlois, M., Segers, P., Cooman, L., Damme, P.V., Cassiman, P., Criekinge, W.V., Verdonck, P., Backer, G.G.D., Gillebert, T.C., Oostveldt, P.V., 2007. Telomere length and cardiovascular risk factors in a middle-aged population free of overt cardiovascular disease. Aging Cell 6, 639–647. Brown, S.L., Smith, D.M., Schulz, R., Kabeto, M.U., Ubel, P.A., Poulin, M., Yi, J., Kim, C., Langa, K.M., 2009. Caregiving behavior is associated with decreased mortality risk. Psychol. Sci. 20, 488–494. Carson, J.W., Keefe, F.J., Lynch, T.R., Carson, K.M., Goli, V., Fras, A.M., Thorp, S.R., 2005. Loving-kindness meditation for chronic low back pain: results from a pilot trial. J Holist Nurs 23, 287–304. Cawthon, R.M., 2002. Telomere measurement by quantitative PCR. Nucleic Acids Res. 30, e47. Cawthon, R.M., Smith, K.R., O’Brien, E., Sivatchenko, A., Kerber, R.A., 2003. Association between telomere length in blood and mortality in people aged 60 years or older. Lancet 361, 393–395. Chrousos, G.P., 1998. Stressors, stress, and neuroendocrine integration of the adaptive response. The 1997 Hans Selye Memorial Lecture. Ann. N. Y. Acad. Sci. 851, 311–335. Damjanovic, A.K., Yang, Y., Glaser, R., Kiecolt-Glaser, J.K., Nguyen, H., Laskowski, B., Zou, Y., Beversdorf, D.Q., Weng, N.-p., 2007. Accelerated telomere erosion is associated with a declining immune function of caregivers of Alzheimer’s disease patients. J. Immunol. 179, 4249–4254. Daubenmier, J., Lin, J., Blackburn, E., Hecht, F.M., Kristeller, J., Maninger, N., Kuwata, M., Bacchetti, P., Havel, P.J., Epelh, E., 2012. Changes in stress, eating, and metabolic factors are related to changes in telomerase activity in a randomized mindfulness intervention pilot study. Psychoneuroendocrinology 37, 917–928. Derntl, B., Finkelmeyer, A., Eickhoff, S., Kellermann, T., Falkenberg, D.I., Schneider, F., Habel, U., 2010. Multidimensional assessment of empathic abilities: Neural correlates and gender differences. Psychoneuroendocrinology 35, 67–82. Entringer, S., Epel, E.S., Kumsta, R., Lin, J., Hellhammer, D.H., Blackburn, E.H., Wüst, S., Wadhwaa, P.D., 2011. Stress exposure in intrauterine life is associated with shorter telomere length in young adulthood. Proc. Natl. Acad. Sci. USA 108, E513–E518. Epel, E.S., Blackburn, E.H., Lin, J., Dhabhar, F.S., Adler, N.E., Morrow, J.D., Cawthon, R.M., 2004. Accelerated telomere shortening in response to life stress. Proc. Natl. Acad. Sci. USA 101, 17312–17315. Epel, E., Daubenmier, J., Moskowitz, J.T., Folkman, S., Blackburn, E., 2009. Can meditation slow rate of cellular aging? Cognitive stress, mindfulness, and telomeres. Ann. N. Y. Acad. Sci. 1172, 34–53. Fredrickson, B.L., Cohn, M.A., Coffey, K.A., Pek, J., Finkel, S.M., 2008. Open hearts build lives: positive emotions, induced through Loving-Kindness meditation, build consequential personal resources. J. Pers. Soc. Psychol. 95, 1045–1062. of the disease. Depress. Anxiety 27, 1111–1116. Zanesco, A.P., Aichele, S.R., Sahdra, B.K., MacLean, K.A., King, B.G., Shaver, P.R., Rosenberg, E.L., Ferrer, E., Wallace, B.A., Saron, C.D., 2011. Intensive meditation training, immune cell telomerase activity, and psychological mediators. Psychoneuroendocrinology 36, 664–681. Kananen, L., Surakka, I., Pirkola, S., Suvisaari, J., Lönnqvist, J., Peltone, L., Ripatti, S., Hovatta, I., 2010. Childhood adversities are associated with shorter telomere length at adult age both in individuals with an anxiety disorder and controls. PLoS ONE 5, e10826. Kotrschal, A., Ilmonen, P., Penn, D.J., 2007. Stress impacts telomere dynamics. Biol. Lett. 3, 128–130. Kvillemo, P., Branstrom, R., 2011. Experiences of a mindfulness-based stress- reduction intervention among patients with cancer. Cancer Nurs. 31, 24–31. Lavretsky, H., Epel, E.S., Siddarth, P., Nazarian, N., Cyr, N.S., Khalsa, D.S., Lin, J., Blackburn, E., Irwin, M.R., 2013. A pilot study of yogic meditation for family dementia caregivers with depressive symptoms: effects on mental health, cognition, and telomerase activity. Int. J. Geriatr. Psychiatry 28, 57–65. Fischld, . Meditation experience is associated with increased cortical thickness. telomerase activity. Med. Sci. Sports Exerc. 40, 1764–1771. Manocha, R., Black, D., Sarris, J., Stough, C., 2011. A randomized, controlled trial of meditation for work stress, anxiety and depressed mood in full-time workers. Evid. Based Complement. Alternat. Med. 2011. Epidemiol. Biomarkers Prev. 16, 815–819. link to X chromosome. Lancet 363, 507–510. the community-dwelling elderly. J. Health Psychol. 4, 301–316. Pace, T.W.W., Negi, L.T., Adame, D.D., Cole, S.P., Sivilli, T.I., Brown, T.D., Issa, M.J., Raison, C.L., 2009. Effect of Compassion Meditation on Neuroendocrine, Innate Immune and Behavioral Responses to Psychosocial Stress. Psychoneuro- endocrinology 34, 87–98. Danese, A., Craighead, L.W., Raison, C.L., 2013. Engagement with Cognitively- Based Compassion Training is associated with reduced salivary C-reactive protein from before to after training in foster care program adolescents. Psychoneuroendocrinology 38, 294–299. Prather, A.A., Puterman, E., Lin, J., O’Donovan, A., Krauss, J., Tomiyama, A.J., Epel, E.S., Blackburn, E.H., 2011. Shorter leukocyte telomere length in midlife women with poor sleep quality. J. Aging Res. 2011. Puterman, E., Lin, J., Blackburn, E., O’Donovan, A., Adler, N., Epel, E., 2010. The power of exercise: buffering the effect of chronic stress on telomere length. PLoS ONE 5, e10837. Ren, F., Li, C., Xi, H., Wen, Y., Huang, K., 2009. Estimation of human age according to telomere shortening in peripheral blood leukocytes of Tibetan. Am. J. Forensic Med. Pathol. 30, 252–255. Salzberg, S., 1995. Loving-Kindness: the Revolutionary art of Happiness. Shambhala Publications, Inc., Boston. Interview (M.I.N.I): the development and validation of a structured diagnostic psychiatric interview for DSM-IV and ICD-10. J. Clin. Psychiatry 59 (Suppl. 20), 22–33. Sibille, K.T., Langaee, T., Burkley, B., Gong, Y., Glover, T.L., King, C., Joseph, L., Riley, I., Leeuwenburgh, C., Staud, R., Bradley, L.A., Fillingim, R.B., 2012. Chronic pain, perceived stress, and cellular aging: an exploratory study. Mol. Pain 8. Simon, N.M., Smoller, J.W., McNamara, K.L., Maser, R.S., Zalta, A.K., Pollack, M.H., Nierenberg, A.A., Fava, M., Wong, K.-K., 2006. Telomere shortening and mood disorders: preliminary support for a chronic stress model of accelerated aging. Biol. Psychiatry 60, 432–435. Smith, T.W., Glazer, K., Ruiz, J.M., Gallo, L.C., 2004. Hostility, anger, aggressiveness, and coronary heart disease: an interpersonal perspective on personality, emotion, and health. J. Pers. 72, 1217–1270. Smith, B.W., Shelley, B.M., Dalen, J., Wiggins, K., Tooley, E., Bernard, J., 2008. A pilot study comparing the effects of mindfulness-based and cognitive-behavioral stress reduction. J. Altern. Complement. Med. 14, 251–258. Sun, Q., Shi, L., Prescott, J., Chiuve, S.E., Hu, F.B., Vivo, I.D., Stampfer, M.J., Franks, P.W., Manson, J.E., Rexrode, K.M., 2012. Healthy lifestyle and leukocyte telomere length in U.S. women. PLoS ONE 7, e38374. Toussaint, L.L., Owen, A.D., Cheadle, A., 2012. Forgive to live: forgiveness, health, and longevity. J. Behav. Med. 35, 375–386. Tyrka, A.R., Price, L.H., Kao, H.-T., Porton, B., Marsella, S.A., Carpenter, L.L., 2010. Childhood maltreatment and telomere shortening: preliminary support for an effect of early stress on cellular aging. Biol. Psychiatry 67, 531–534. Unryn, B.M., Cook, L.S., Riabowol, K.T., 2005. Paternal age is positively linked to telomere length of children. Aging Cell 4, 97–101. Valdes, A., Andrew, T., Gardner, J., Kimura, M., Oelsner, E., Cherkas, L., Aviv, A., Spector, T., 2005. Obesity, cigarette smoking, and telomere length in women. Lancet 366, 662–664. Werner, C., Fürster, T., Widmann, T., Pöss, J., Roggia, C., Hanhoun, M., Scharhag, J., Büchner, N., Meyer, T., Kindermann, W., Haendeler, J., Böhm, M., Laufs, U., 2009. Physical exercise prevents cellular senescence in circulating leukocytes and in the vessel wall. Circulation 120, 2438–2447. Wolkowitz, O.M., Mellon, S.H., Epel, E.S., Lin, J., Dhabhar, F.S., Su, Y., Reus, V.I., Rosser, R., Burke, H.M., Kupferman, E., Compagnone, M., Nelson, J.C., Blackburn, E.H., 2011. Leukocyte telomere length in major depression: correlations with chronicity, inflammation and oxidative stress – preliminary findings. PLoS ONE 6, e17837. Yen, Y.-C., Lung, F.-W., 2012. Older adults with higher income or marriage have longer telomeres. Age Ageing, 1–6.